Dr. Shannon Potter with her husband Ryan and children Sydney and Zachary. Dr. Potter served in Africa as a Post-Resident through World Medical Mission. Two years in Africa taught a World Medical Mission doctor to be prepared at any time for a medical emergency. Dr. Shannon Potter figured keeping her young son and daughter entertained for 10 hours would be the biggest challenge she faced on her June 27 flight from West Africa to the United States. Shannon and her husband, Ryan, and their two children, 3-year-old Sydney and 18-month-old Zachary, were looking forward to a six-week furlough with family and friends. They were en route to New Jersey with plans to visit Missouri and other home bases. An obstetrician/gynecologist, Potter had been serving at mission hospitals in Togo and the Democratic Republic of Congo since 2015 through World Medical Mission’s two-year Post-Residency Program. When it comes to medical challenges, the physician thought she had seen and done it all in Africa. But God had one more special assignment for her before she reached American soil. Less than halfway into the flight to New Jersey, the crew asked for medical assistance at the back of the plane. Potter found a Middle Eastern woman adorned in a traditional abaya, sitting in a jump seat that flight attendants use for takeoffs and landings. The pained look on her face, with a glint of hope and expectation, was one that Potter had seen many times. The woman was in labor. Potter serves women and their families in Jesus’ Name. This was not the first time Potter has been called upon to assist a woman in labor in an unconventional place. “Not one, but two babies were born in my apartment building in France, both requiring my help. At least on the plane, we had plenty of blankets and gloves,” she wrote. Potter confirmed to the flight attendants that the woman’s water had broken and she was already dilating. For the time being the only thing they could do was time her contractions and make her as comfortable as possible. With six hours of flight time to go, it was possible the woman could make it until they landed, but Potter advised the flight attendants to be prepared for a delivery in the air. They moved the woman from the galley into the back two rows of the plane. Her husband stayed by her side, faithfully recording her contractions. While Potter monitored her, the couple’s daughter helped look after Zachary. With under three hours to go, the woman’s labor intensified. She was moved back to the galley for more privacy and space to move around. Since no epidurals were available, Potter coached her through natural techniques to tolerate the pain. Potter with medical students at Vanga Hospital in the Democratic Republic of the Congo. The woman’s delivery was nearing with just 30 minutes to go in the air. However, the flight attendant explained that, even with an emergency priority landing, they would have a 40-minute taxi before the ambulance could be ready to take her to a hospital. I told her husband, “Tell her to trust God that He will help her push this baby out.” And with the next contraction, the head delivered, then the body, and we had a screaming, beautiful newborn baby getting wrapped in Ethiopian Airlines blankets. The mother clung to her newborn daughter during the landing. To shield the woman from moving, her husband positioned himself at her side and Potter sat on the other side. Members of the crew later had pictures taken with the happy family as the plane taxied toward a waiting ambulance. It wasn’t until the paramedics and police escorted the family through the plane that many passengers became aware a baby had just been born. The mother went first in a wheelchair, then the older daughter and the father carrying his baby girl, with Potter following behind. The flight attendant pointed to Potter and explained, “She just delivered a baby. She’s a hero.” For Potter, it was “all in a day’s work.” She pointed back to the exultant mother, who had displayed calmness and courage throughout the delivery. The proud father with his baby girl. “Going into labor, let alone giving birth in a plane, is a horrifying ordeal, but you managed to make it one of the most enjoyable and memorable moments of my life,” the mother commented. “I will forever be indebted to you and will always have a special place for you in my heart. The Potters are returning to Africa in August, this time to Kenya where Ryan has accepted a teaching position at Rift Valley Academy. Meanwhile, Shannon will be a full-time mom for several months before resuming her medical mission work in 2018. Her plans include serving a short stint on the MercyShip off the coast of Cameroon. Beyond that, their family will wait and see where the Lord leads them next. Reflecting on the memorable “air delivery,” Potter knows it was no coincidence that God placed her on that specific June flight from Togo to meet a medical need and share the love of Christ. The Potters had originally planned to fly to the U.S. in mid-July. Post-Residency Program The World Medical Mission Post-Residency Program is a fully funded two-year program for Christian physicians and their families who have been called to medical missions. 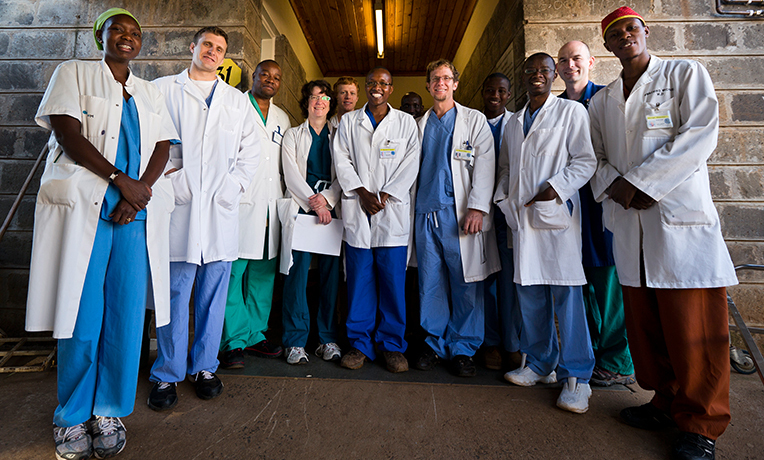 Following their residency, doctors are placed at a mission hospital to serve within their specialty alongside career medical missionaries. We provide logistical and financial support to these young men and women as they treat patients and share the love of Jesus Christ.